One of the heavily used kitchen equipment in the entire country, India is a pressure cooker. There are many advantages of pressure cooking compared to the non-pressure cooking system. And, that is the very reason for the effective use of pressure cookers all over the country. It is a must-have kitchenware to cook delicious food on a daily basis. Today, we will discuss a list of pressure cookers that are called the best in the country. We consider various factors before deciding which brand and model makes to this list. The working principle of a pressure cooker is simple; increasing the pressure and temperature inside the cooker without letting the steam to escape cooks the food easily and quickly. The lid of the pressure cooker is equipped with a pop-up road which acts as a signal that the food is cooked. It also whistles up when full pressure is attained which allows excess steam to escape. There are many benefits of using a pressure cooker. We will discuss the important ones here that will help us build the list too. Pressure cooking saves 50 – 70% of the fuel used to cook irrespective of cooking gas or electricity usage. It also cooks 30% faster than non-pressure cooking. The steam pressure cooking retains most of the vitamins and flavors while cooking compared to the dry heat cooking. You will find a taste variation between the two types of cooking as pressure cooked dishes taste good either boiled, simmered or braised. With these two base factors, we will here select the best cookers available in the market and at a reasonable price range. Now, the next step is dependent on you since the selection of a number of liters required along with the type of base material will be your decision to make. There are two types of base materials used to manufacture pressure cookers – Aluminum or Stainless steel. Both these materials have their own pros and cons. Stainless steel is durable and comes with extra hardness but is expensive and heavy. While Aluminum is lightweight and comparatively cheaper but you will have to compromise on the sturdiness of the kitchenware. Technology has invented something called Hard Anodized Aluminum that improves durability and hardness with less possibility to corrode. On a general note, the list is difficult to put together since the requirements of the consumers are not always the same. However, we have tried to consider every possible factor while making this list of top brands with the latest technology embedded in the pressure cookers. It is 1st in the list of best pressure cookers in india. Hawkins is a veteran in the manufacture of cookware and has come up with this excellent model Futura. Futura is manufactured from hard anodized Aluminum. It doesn’t have the orthodox look of a cooker, rather comes with a premium look with its sleek design. 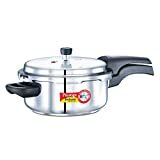 It is 2nd in the list of best pressure cookers in india. Another veteran in the cookware industry, Prestige introduced the Handi design that focuses on even spreading of heat all around the food. Check out the specifications to see if this is what you are looking for. It is 3rd in the list of best pressure cookers in india. Another excellent product from Hawkins is the Contura models. Check out the specifications to see what it has to offer. 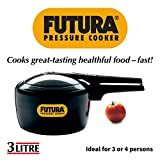 Pigeon By Stovekraft Belita Hard Anodized Super Cooker Set, 3 Ltrs, 4-Pieces, Black. It is 4th in the list of best pressure cookers in india. We discussed the orthodox type cookers with the latest design and technology until now. However, this model is a multi-purpose cooker set. It comes with a normal lid and a strainer that helps in the cleaning process and draining hot water with ease. The pot is manufactured from virgin Aluminum with a scratch resistant and ceramic coating. Metal spoon friendly and compatible with induction stoves too. It is 5th in the list of best pressure cookers in india. Another excellent product from Prestige with a more orthodox design, Deluxe Alpha model is quite heavy yet very durable. It comes with Alpha base induction bottom and has controlled GRS. With the last Deluxe Alpha model from Prestige, these are the top 5 best pressure cookers in India. You should now be able to make the smart choice to buy the one that suits your cooking style and fulfills all your kitchen needs.